Dave Leather is a Global Medical Affairs Leader in the Respiratory Franchise at GSK, based at GSK House in London in the UK. He leads the Global Medical Expert team: a team of world-renowned respiratory experts who work for GSK providing internal scientific and clinical expertise to support promoted medicines and those in development. For the last 4 years he led a team responsible for developing Phase lll and Phase lV trials for respiratory medicines. 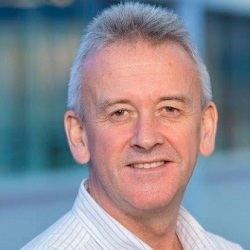 He also has a leadership role in “real world pragmatic trials” and is the Franchise leader of the internationally recognised Salford Lung Study. He joined GSK in 2000, and has held a variety of posts within the company. Originally a primary care physician in Bolton with an interest in respiratory disease, Prof. Leather managed asthma and COPD clinics in a primary care setting and held a post as a clinical assistant in Respiratory Medicine at University Hospital Aintree, Liverpool. He was a GP Course Organiser, a member of the Council of the Royal College of General Practitioners (RCGP), and worked as a media doctor for the BBC and commercial radio.